It's the Saturday after the big "feast" and you're probably wondering what in the world do I do with all this leftover food? Why not make an entirely different meal out of it all? If you're looking for some easy ways to "eat it all up," check out a couple of my posts from our last holiday season! Enjoy! Layer half the potatoes into a 13x9x2 inch greased glass baking dish. Top with ham and cheese. In a saucepan, over medium heat, melt butter. Add pepper and mushrooms; stir and cok 5 minutes or until tender. Spoon over ham, cheese layer; top with remaining potatoes. In a bowl, combine eggs, milk, cottage cheese, and black pepper. Beat until well blended. Pour mixture over all. Bake uncovered at 350 degrees for 50 minutes or until ligh brown and center is set. 2010 will bring undoubtedly bring new recipes, but I'm also starting a new "feature" on the blog. Each month we'll showcase a "guest chef" here on Cooking With Court. Just some fellow foodies in my life who will be sharing some of their favorite recipes. We can all gleam fabulous recipes from each other, and some of them even have their own blogs that need to be shared. So keep checking back...I've already got several chefs lined up and ready to go for ya'll! My latest issue of Kraft Food & Family showed up the other day, and I was thrilled to see several new recipes I'm looking forward to trying out. 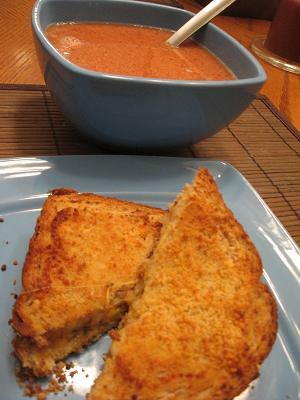 Tonight, the hubs and I were looking for something quick to eat as we were both starving after a long day at work...usher in Kraft's Ultimate Crispy Grilled Cheese Sandwich and a bowl of tomato soup and our tummies were HAPPY! It's a nice "twist" on the typical grilled cheese sandwich we all know and love. And if you're looking for another great "twist" to add...check out my previous blog on grilled cheese sandwiches here. Spread the outside of sandwiches with margarine, place on baking sheet. Bake sandwiches for 8 minutes. Then sprinkle with half the parmesan cheese. Flip sandwiches; sprinkle with remaining parmesan. Bake 6 to 9 minutes longer or until golden brown. Serve with your favorite soup of choice! My sister actually sent me this recipe. It's originally from this blog. I'm a sucker for a good muffin, so I was really intrigued by these. 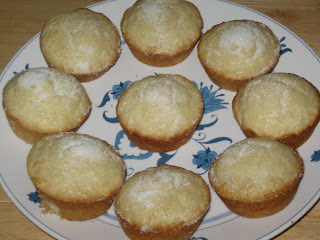 An easy alternative to the typical lemon poppyseed muffin. Mix dry ingredients in a bowl. In another bowl, mix only 1/2 cup lemonade, egg, milk, and oil. Add to dry mix, stirring until just moistened. Gently stir in nuts. Spoon into prepared pans and bake and bake at 375° F. for 15-20 minutes or tests clean. While hot, brush with remaining lemonade and sprinkle with white sugar. I frequent an online forum where I stumbled across a really great cooking blog. Elizabeth is from the Minneapolis area like myself, and has some really great recipes. You should really check her out! I was immediately drawn to her Cabbage & Meatball soup as 1) it sounded delicious and 2) it was a recipe from her Grandmother that she grew up on. Knowing how close I was to my Grandma and how everyday I strive to be even 1/10 the home cook she was, I thought it was great to share such a personal memory. My hubs and I made this soup on a Sunday afternoon as we settled in to watch some football. It's a perfect fall/winter recipe and it was FAB. Very easy to make as well! Try it. You'll like it. And be sure to check out Elizabeth's other recipes here! Melt butter in a large stockpot. Add onion, celery, carrot, and garlic and cook about 5 minutes, or until the onions begin to soften. Season with salt & pepper. While the veggies are cooking, chop up the cabbage. Add cabbage and stir. Let the cabbage cook for about 3 minutes. Add broth & water. Put a lid on the pot and let simmer. While the pot is simmering, mix together the ground beef, salt & pepper, garlic, parsley, egg, bread crumbs, and Parmesan cheese. Form into small balls (about 1" - 1 1/2") and add to the pot. Keep the cover on and let cook for about 10-15 minutes. If the pot comes to a heavy boil, turn down the heat. Season with salt & pepper to taste.